Wireless solutions ... growing trend in physical security. Integrated access control solutions are the way forward for businesses today, given the modularity and scalability of the latest security offerings, says Saudi-based Universal Building Materials Merchants (UBM). AN ACCESS control solution can be as simple as the use of electronic RFID (radio-frequency identification) cards instead of mechanical keys to unlock a front door. This limited functionality still retains considerable value. In most cases, businesses can limit which cards are able to access the door during specific times, thus allowing all employees to have “keys to the shop”, without risking unwanted access to the premises out of hours. In addition, security managers benefit from the ability to check or report on who attempted to enter the premises and at what time. At the other end of the spectrum is a fully integrated access system, controlling multiple buildings, which seamlessly integrates with other security systems such as access control, escape route control, elevator control, visitor management, photo badging, door manager, time attendance recording, video and intruder systems to form an overall system. The latest systems even link access control with corporate IT systems – so-called physical/logical convergence – to reduce the risks of unauthorised access to business-critical IT platforms and also attendance recordings can be integrated with any HRMS (human resources management systems), payroll and ERP (enterprise resource planning) systems for better benefits. • Reporting for regulatory or compliance purposes. Besides preventing unwanted visitors and minimising risk to stock and equipment, effective access control also safeguards against costly and potentially disastrous business interruption. In this era of high technology, security systems are evolving quickly, offering more features and greater levels of integration. Indeed, security systems work best when functioning as a holistic solution to meet site-specific risks, where their full potential can be realised. That means integrating equipment such as CCTV (closed circuit television) cameras and recorders, access control, video analytics monitored perimeter fencing, and intruder alarms. In the past, true security systems integration used to be the exclusive preserve of a small number of end-user companies willing to pay large amounts of money for high-level functionality. Typically, it was delivered by specialist systems integrators with strong engineering teams, who had the breadth and depth of technical expertise required to bring together a range of disparate products from independent CCTV, access control and intruder alarm/detector manufacturers to create a fully integrated security system. Problems encountered in matching different security system control protocols led to difficulties in enabling these systems to ‘talk’ to each other. Various solutions were attempted to resolve this ‘language barrier’ as system suppliers sought the key to unlocking the benefits of interoperability. • Site occupancy reporting capabilities. Wireless solutions have recently been getting on the radar for access control installations – it’s time to take notice of this growing trend in physical security. Such solutions let integrators and end-users reap the benefits of a wired system, without the cost of a hardwired system. Implementing a wireless solution often takes less time than its traditional hardwired counterpart. When retrofitting older buildings with new access control systems, wireless systems may literally be the only viable option available. 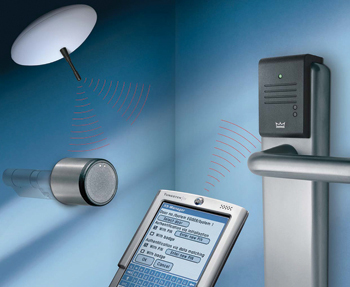 Wireless readers are not just used for doors – wireless solutions exist for elevators, exit devices, and gates. These work with most of today’s access control systems. That means users don’t have to replace their existing ID credentials. Such systems are an attractive alternative to off-line, standalone locking systems, because they offer a real-time solution that’s compatible with nearly all brands of access control. And, in today’s world of chronically short time and budgets, wireless solutions work particularly well for airports, marinas, schools and universities, healthcare institutions and corporate facilities. Truly, wireless systems could be applied anywhere a lock is installed, but there are certain applications that lend themselves particularly well to wireless installations. Older buildings that would be difficult or impossible to hardwire come to mind. Whether they are installed in new modern buildings or historical landmarks, however, wireless locking systems preserve the integrity of the architectural design. Another plus – potential asbestos issues are avoided entirely. While wireless locksets work equally well on wood and metal doors – both interior and exterior – there are several other wireless applications as well. These include glass, monitored and scheduled doors, gates and portable solutions. Elevators are another prime candidate for wireless systems. Travelling cables are routinely included at the time of installation, yet they are often ill equipped to reliably transport credential data from the cab to the elevator controller. Elevator shafts are harsh electrical environments and are often the source of data corrupting noise that becomes induced onto the card reader data lines. This causes inconsistent performance, which often gets worse over time as cable shielding decays due to continual movement. Conversely, wireless solutions eliminate the need for the data lines in elevators. In fact, they thrive in this environment and provide consistent, reliable data transport that doesn’t wear out. Wireless alternatives can save thousands of dollars per elevator. The value proposition for implementing wireless systems in a wide variety of networked openings is compelling. Real-life installations prove that a reliable wireless solution can have a substantially lower installed cost than its wired alternative. What’s more, wireless systems use less hardware and install between five to 10 times faster. Even in situations that might once have seemed impossible, retrofitting electronic access control systems is now made easy and affordable with wireless access control. Nowadays all major facilities require smarter access control systems. Indeed, true integration can offer far more functionality than just the security of staff and premises of organisations; it can extend to encompass all aspects of a business including cashless vending, site health and safety compliance, control of access to restricted areas such as clean rooms, and verifying authenticity for payroll purposes. Whilst the level of sophistication will vary in accordance with budget and requirements, given the modularity of today’s security offerings, it is now much easier to steadily build up an integrated solution in line with the requirements and budget availability. Organisations can implement different parts of the core access control, escape route control, elevator control, visitor management, photo badging, door manager, time attendance recording, video and intruder systems over time, knowing that they are interoperable, and can eventually be combined into a holistic security system. So an integrated solution is now within any company’s reach and is undoubtedly the new standard for any company serious about security.